The first and most obvious benefit of professional junk removal is that someone else will remove your junk for you. You simply call them and they come to your house. You don’t have to lift a finger unless you want to. That’s great for people who have mobility issues or lead busy lives. In many cases, the junk removal services that you hire will even sort the junk for you. If you are interested in recycling but don’t have the energy or the resources to do so, you could hire a junk removal service that will do it for you. Even if you have the resources to sort your recycling or to take your trash to the waste transfer center, you can save time by having a professional do it. You can even save some money as well. You can save money with professional junk removal depending on how much you are moving. In some places, depending on the kind of trash, you have to sort it yourself or pay a fee. Also, disposing of certain chemicals such as used motor oil requires a special process that sometimes requires a fee. Oftentimes, junk removal services will factor those fees into their price. Furthermore, you’ll save money on fuel that you would spend driving your trash to the dump. 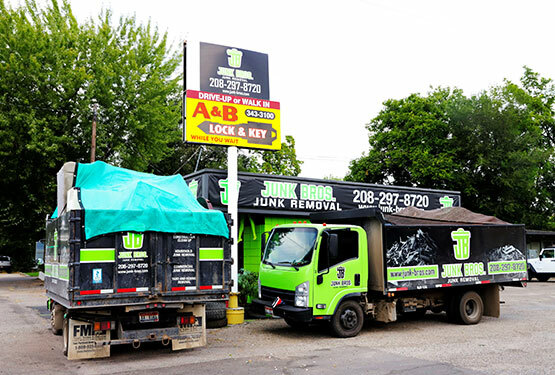 Since junk removal services are priced for bulk trash, they will often be less expensive than paying the fees and driving the trash yourself. In many cases, it can be somewhat dangerous to remove junk from your home. For example, the junk from a home renovation or from a demolition job could contain nails and other dangerous objects. If you’re not comfortable with removing it yourself, professional junk removal keeps you safe.